Brighton and Hove Albion saw off Championship side Derby County in the FA Cup fifth round this afternoon, after they survived a late fightback from the largely quiet visitors. Brighton were lively in the opening stages with Yves Bissouma and Anthony Knockaert combining well, with gaps in Derby's defence to exploit. It was all Brighton in an exciting start to the game but the hosts didn't look like troubling Kelle Roos in the Derby goal. Knockaert came close after 12 minutes with a curled free-kick that had to be pushed over the bar by Kelle Roos before Fikayo Tomori was booked for a challenge on Jurgen Locadia, who stayed down. The Dutchman had treatment to his ankle but was able to continue. Bissouma fired the resulting free-kick under the wall at goal and Roos had to get down to tip it away, but the forward then wasted an excellent opportunity on the right by firing wide, off balance on a swift counter attack. Knockaert had Albion's best chance of the first half hour with a 20-yard strike which forced a corner after a good Roos save. The Frenchman then made the hosts' pressure count after 33 minutes with an excellently taken finish into the bottom corner from 18 yards after being picked out by a low cross from Bissouma. Derby, who looked sloppy and too often lost the 50/50 battles, looked for way back into the game and started to look more threatening, but Albion remained dangerous on the counter attack. That almost brought a second goal as Alireza Jahanbakhsh was able to break superbly but he was brought down by Tomori who escaped a second yellow card. Martyn Waghorn then had arguably The Rams' best chance of the half from a tight angle at close range, but he shot straight at David Button. Brighton broke away and got a much needed second goal just before the break after a fantastic curled effort from Bissouma hitting the post before falling nicely for an unmarked Locadia to tap the rebound home. Frank Lampard reacted to his side's poor first half performance by bringing on Ashley Cole and Jack Marriott at half time for Scott Malone and Duane Holmes. Lampard clearly had a few words to say at the interval as the visitors vastly improved in the early stages of the second half. They started to put Brighton under pressure and Liverpool loanee Harry Wilson came close after being squared by Jayden Bogle. Shane Duffy came to the rescue with a vital headed block. The Seagulls looked much quieter with Shane Duffy providing the most excitement in the first 20 minutes of the second half with a rare attacking run forward before being crowded out. Derby started to put on some sustained pressure for the first time in the game but rarely looked like testing the keeper, with their forwards appearing quite static. Brighton continued to play on the break, and it almost saw Knockeart grab his second of the game on the 70th minute, but his low effort was saved by Roos when through on goal. Derby, with their last throw of the dice, brought on Florian Jozefzoon for the ineffective David Nugent. Brighton came inches away from sealing the game on the 75th minute, with a superb Roos save denying Bernardo's acrobatic effort after Duffy had headed a corner across goal. 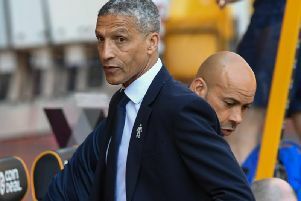 Chris Hughton then made his first change as Locadia, who appeared to take a second knock of the game, was taken off for 20-year-old Swede Viktor Gyokeres with ten minutes to go. Out of nothing, Derby found a lifeline in a game they looked out of, as Cole justified his half time introduction with an impressive headed finish after a poor clearance Dan Burn. Hughton reacted by switching out Bissouma for midfielder Pascal Groß. Albion had a chance to seal the game with a minute of normal time to play with sub Gyokeres sent clear, but Roos was quickly off his line to block the shot. A nervy four minutes of injury time ensued for the home side, with Button dropping Jozefzoon's cross before falling to Wilson who couldn't find the target. Derby continued to threaten an equaliser and looked vulnerable on the counter attack, but Albion failed to take advantage despite two golden opportunities. However, they held on for a deserved win and progressed to the quarter-finals. Brighton: Button, Bruno, Duffy, Burn, Bernardo, Kayal, Stephens, Bissouma (Groß 84), Knockaert, Locadia (Gyokeres 80), Jahanbakhsh. Subs: Ravas, Wisdom, Cole, Evans, Johnson, Jozefzoon, Marriott.